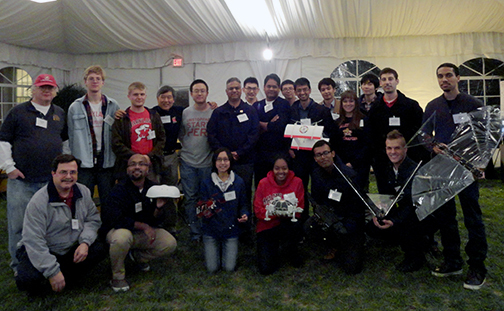 On Saturday, Nov. 15, Maryland Robotics Center students and faculty demonstrated robotics projects at University of Maryland President Wallace Loh's home, University House, as part of a pre-football game reception. Guests were welcomed by Vice President for University Relations Peter Weiler, who introduced the center and its director, S.K. Gupta. In his remarks, Gupta explained how the convergence of low-cost computing; low-cost sensors and actuators; and advances in artificial intelligence, cloud computing and manufacturing are expected to revolutionize robotics. He spoke about how robots are already an integral part of modern manufacturing, space, and defense industries. The next generation of robots, Gupta said, will begin to affect people's lives, performing such tasks as cleaning, yard maintenance, and snow removal. Robots also will help elders live independently in their homes and fundamentally change the notion of assisted living. Robots are also expected to play a significant role in areas like minimally invasive surgery to improve patient outcomes and reduce recovery time, Gupta said. This role will grow and expand to rehabilitation and diagnostic testing. Food production and ensuring food safety is another area where the use of robots is expected to expand. Flying robots can be used for crop inspection and improving yields. Robotic manipulators can be used for picking fruits from trees and making sure that rotten and infected fruits and vegetables do not enter food processing plants. Someday robots will be programmed to prevent the outbreak of food-borne bacteria. Robots also are expected to revolutionize the firefighting and mining industries and save lives. Gupta’s presentation was followed by faculty, research scientist and graduate student demonstrations, posters and videos. From Gupta's Advanced Manufacturing Laboratory and Simulation-Based System Design Laboratory, Krishna Kaipa, Alex Holness, Lena Johnson, Luke Roberts, Brual Shah, and Shaurya Shriyam demonstrated bio-inspired robots, including Robo Raven, Robo Crab, and NaviGator (a robotic alligator). To the delight of President Loh, the group also demonstrated Robo Terp, a robotic representation of a terrapin. From Sarah Bergbreiter’s Micro Robotics Laboratory, students Alexandros Charalambides and Mary Tellers displayed miniature robots that will make it possible to develop situational awareness in disasters such as earthquakes. Shing Shin Cheng, Yeongjin Kim, and Jun Sheng from Jaydev Desai’s Robotics Automation Manipulation and Sensing Laboratory showcased the Neurosurgical Intracerebral Hemorrhage Evacuation (NICHE) robot and Minimally Invasive Neurosurgical Intracranial (MINIR-II) robot. These medical robots are expected to greatly enhance the field of neurosurgery. Vikram Hrishikeshavan, Elena Shrestha, and Derrick Yeo from Derek Paley’s Collective Dynamics and Control Laboratory (and students of Paley and from Inderjit Chopra) demonstrated a quad biplane and Cyclocopter, a cycloidal-rotor aircraft at micro-air-vehicle scale. Associate Professor Dave Akin and his students Daniil Grabok, Donald Gregorich and Johnny Mao from the Space Systems Lab featured the DYMAFLEX arm attached to a small satellite base. In this lab, the next generation of robots is being created to enhance the productivity of astronauts.